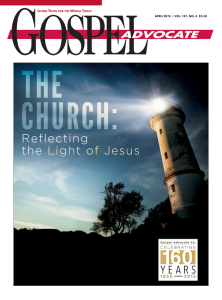 In every issue of Gospel Advocate is a human interest column called “The Anderson Files” written by GA publisher Neil W. Anderson. This article is excerpted from the April edition. A lot of fascination has recently been expressed in a person’s “bucket list,” those things an individual would like to do while still able. I don’t have a bucket list, but I do have a wish list. As the GA approaches our 160th anniversary, I wish to add considerably to our archives. I would love to have more of those little cards that made up our curriculum for children for many years. I would be happy to receive old copies of the GA, not from the last three or four decades but from the really early days – the 1860s to the 1900s. Our archives have very few of the advertising items from our past. Any of those things bearing the GA logo used to remind people of the company and of its work with churches would be a great addition for us. Finally I would be particularly interested in any correspondence with the staff of the GA over the many years. How easily we let the past slip away! Only when we have a major anniversary do we think about reclaiming some of that past. That’s why I am thinking of my “wish list.” Email me at neil.anderson@gospeladvocate.com.